I'm encountering what appears to be a bug in the display of  > System Preferences > Keyboard: Shortcuts - App Shortcuts. The shortcuts are functional, but as you can see, their names randomly display as ellipses. The phenomenon seems random. Quitting/reopening sys prefs will cause the badly displayed items to change. Adding or deleting items also causes the display problem to shift to other items. Selecting a name causes it to appear truncated. As the prefs for keyboard shortcuts are stored all over the place, I'm unable to simply delete a .plist and try again, and given that I've got dozens of custom keyboard shortcuts, starting from scratch would be onerous. I can replicate the problem in a fresh user account on the same system. Obviously this isn't anything like fatal - the shortcuts work correctly - but working with them is insanely difficult. 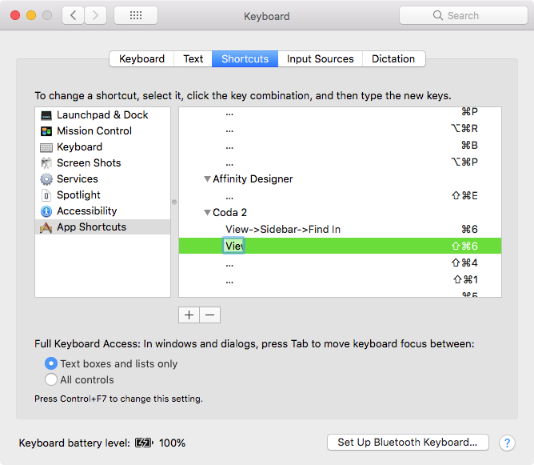 Browse other questions tagged macos keyboard shortcut system-prefs keybindings . Menu title in Keyboard Shortcuts?